Deck and LWB in original box. Cards never used. Box has slight shelf wear. 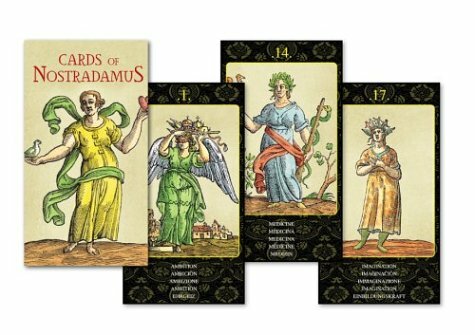 This 78 card oracle deck is created from original Renaissance prints. Recolored to highlight their charm, these images are elegant and inspiring. The medieval iconography beautifully illustrates the attributes of each card and somehow reaches across the centuries to speak to us. In addition to pleasing the modern eye, the Cards of Nostradamus are easy to use.